Why are there lines on the edges of some of the tiles on my 2D tilemap? I am generating a flat mesh and setting the UVs to correspond to a tile in a tileset png file that I have set as an Advanced Texture. Most issues I've found that have a similar problem just say to set the Filter Mode to Point. As you can see, I have it set to that. Anyone have any idea why those lines are appearing between tiles? I wonder if it is because the tiles are very small (32x32 pixels) and the floating point texture coordinates aren't accurate enough to pick out 32x32 pixels from the tileset image? 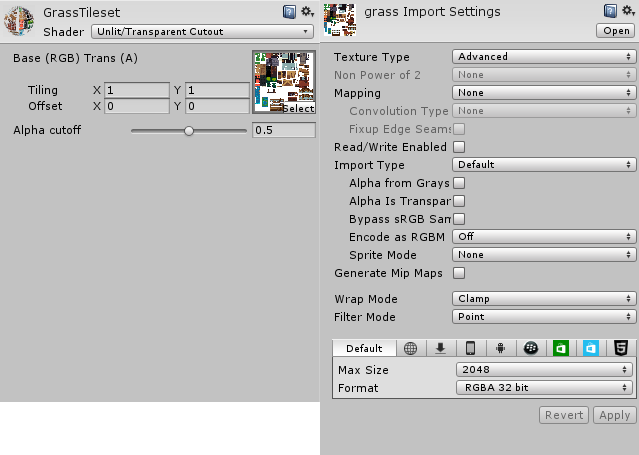 Have you tried changing the Wrap Mode settings on your texture in the inspector? I think it's on "repeat" by default. Try "Clamp" instead. Unfortunately I think Clamp will work only on the atlas' limits, not inside. I've already got it set to clamp. You can see my full texture configuration in the second screenshot. Thanks! 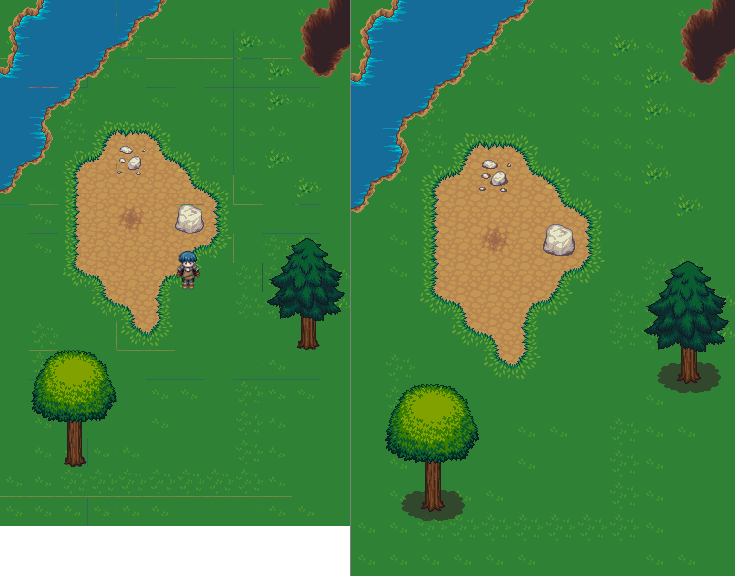 Normally when working with tile maps in Unity there needs to be a small gap between each tile in the atlas. This is because Unity uses a 3D renderer, which isn't 2D pixel perfect. A particular tile bleeds into the neighbors when rendered. Many atlas generators have options for spacing, padding, or margins. For example, TexturePacker calls this option "Shape Padding."